I actually started writing this post yesterday, but didn't get a chance to finish it and overnight I've discovered that one of my Laurels (below) that I entered into the Colette Patterns Laurel contest has won second prize in the 'Added Detail or Embellishment' category! 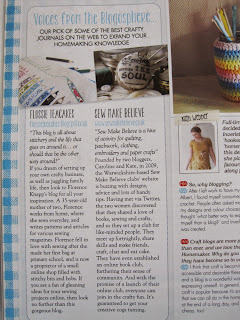 I'm so flattered to see my top alongside such amazing dressmaking talent - do go and check out the other winners. If you quilt you'll especially love the dress which won first place in this category as it combines precision piecing with dressmaking. So, topically, this post is about one last Laurel (no, I don't actually believe that either, but I feel the need to at least attempt to offer up the illusion of there being some diversity to my dressmaking). I actually made it a few weeks ago, but I've been crazily busy and I haven't had time to blog about it until now. This one is interlined, as the cotton was very sheer. For those questioning the difference between lining and interlining: if you line something, essentially you create an identical garment and then sew the two garments so that seam allowances are sandwiched, unseen, in the middle of the two. If you interline something, at the outset you simply sew two pieces of fabric together and then treat them as one - this way doesn't hide any of the seam allowances, but that wasn't necessary here as I was using french seams. I used an incredibly fine voile for the interlining that had the exact weight and drape of the large spotted dobby fabric (is it dobby when the tufted spots are this large?). Out of the three Laurels I've made, I attached one collar with a bias binding finish, another as a traditionally-installed Peter Pan collar covering the join with a strip of bias inside the blouse, and for this final Laurel, I went off piste entirely. I didn't sew the interlining fabric to the outer fabric at the outset as you normally would, but instead sewed the interlining back and front pieces together at the shoulder seams and then did the same for the outer fabric. 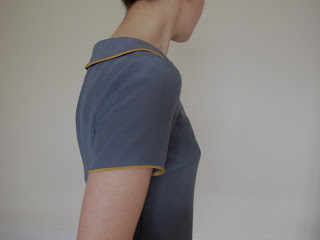 I was then able to temporarily treat the interlining fabric as a facing, and sew the Peter Pan collar inside this sandwich to give the simplest of installations from all the collar insertion techniques I've experimented with. I then sewed the interlining fabrics to the outer fabrics in the conventional way and from that point on treated the fabrics as one. I left the sleeves unlined as I quite like being able to see the fabric as it really is here. It's actually my least favourite of the three Laurels I've made, as no matter how fine the fabrics are, two layers of fabric won't replicate the flowing drape of silk. Silk tends to fall over your curves, and has a slight static that makes it follow the exact line of your figure, but without being clingy. An interlined cotton, no matter how light both the fabrics are, tends to fall over your curves, but then stands proud from the body. Everyone tends to have an issue that they are mindful of when dressmaking and mine is a big-bottom-in-relation-to-the-rest-of-me, which is exacerbated by having a very, very short body (because how much back can you realistically squeeze into 5ft1" without losing room for legs, neck and a head?). If the drape isn't just right it can make things look even more out of proportion; if the fabric doesn't fall back in at the the waist and stands proud of my body from bust to bottom (yes, I know they're on different sides of my body & that's what makes for a double-width tube!) it can make me look slightly shapeless. The photo you see below is the 'flattering photo'. I'm having to delete the 'unflattering truth' photo from my memory or I may not be able to actually wear this top. It's an interesting experiment to make so many versions of the same top and to observe how it can morph from flattering to unflattering purely because of the drape of the fabric. I like how it looks from the front though, so it may get some heavy with-cardigan usage. Hence why I think I may make another Laurel as I'd still really like a practical cotton version, but perhaps in a cotton that isn't so sheer that it requires interlining, which would hopefully make the drape less of an issue. I usually make my own bias binding in self fabric or a contrasting fabric, but for this top I used pre-made bias. I actually love working with the pre-made version - the bias strip is so heavily starched that it's easy to manipulate and the pre-formed creases are satisfyingly crisp. It seems to knock so many minutes off construction time! 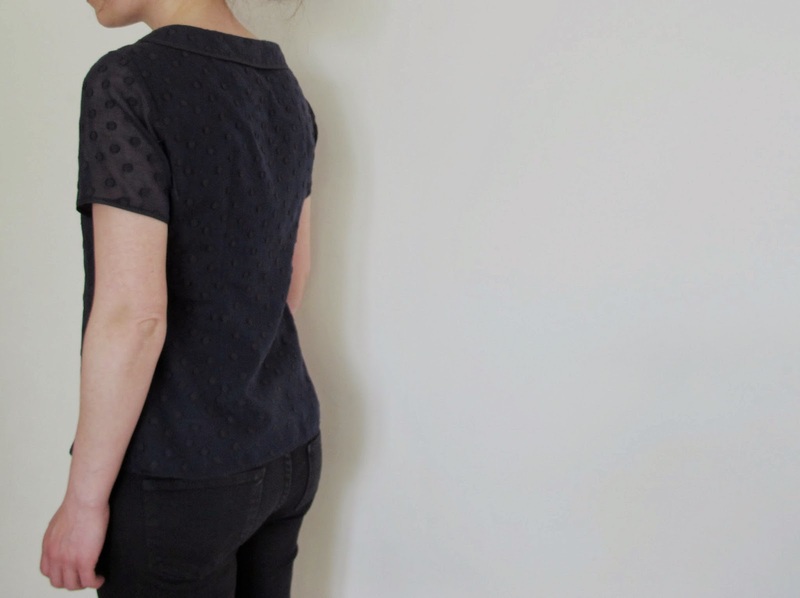 The inspiration for this top and the fabric use actually comes from something I pinned on Pinterest over a year ago. My version seems rather demure next to the original foxy inspiration top, but I'm not sure I would wear something quite that see-through....or with such puffy sleeves. Interestingly, it's only since making up my book of croquis that I've been able to see why, despite my absolute love of puffed sleeves (who couldn't watch Anne of Green Gables as a child and not develop a life-long love of them? ), they will never suit me. If you look at the photo above, you can see it's really only the top on the left that actually flatters my frame. The rest give a very curious effect indeed. If you'd like more Laurel inspiration, you can find plenty in the Colette Patterns Flickr pool. 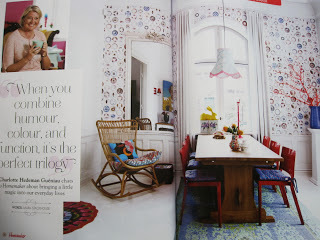 My prize for coming second was £50 worth of Colette Patterns! I'm more than a little excited by that proposition - my quick trawl of the Flickr pool has made me think that a Hazel and a Peony dress pattern seem to give a good fit and look consistently lovely in the photos in the pool - do you have any recommendations of your own? I'm also pondering the Sencha blouse, but I'm not sure if there's too much going on around the waist that may overwhelm my petite frame. I don't actually dislike being small at all, but I do look at my super-tall mannequin and think that it must be so much easier to carry off any piece of clothing if you have more height. Although I'm sure that comes with challenges that wouldn't even have crossed my mind. I'm not sure if I've mentioned the freakish thing that happened when I was pregnant for the first time - I grew! When I returned to wearing some of my old clothing, once my daughter was here, I realised that most of my clothes seemed a little shorter. At first I thought this might be because I was a tiny bit bigger and so perhaps I was wearing them in a different way, but eventually I got my husband to measure me and we were both alarmed to find that I'd gained a whole inch in height! That pregnancy had been hideously uncomfortable and it seems it stretched my vertebrae out somehow - who knew that could happen? And just in case you're wondering, my second pregnancy passed without any height adjustments, despite my husband anticipating that if we were to carry on having children I would eventually tower over his 6ft2" frame. It seems like most of the people I know in England have been struck down with a cold. Very possibly because we've been kept in the fridge for too long with the absence of any summer weather. 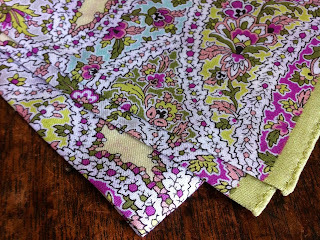 This is my current handkerchief, for indoor use only because it is absolutely enormous and could easily be restyled into a voluminous smock top or possibly even cover my entire head and face if a sudden gust of wind came along. I think I probably knew that it was an impractical size when I bought it, but I was completely taken in by the print (yes, it's Liberty). It is almost impossible to blow your nose in a dignified way with something that resembles a small table cloth though, so it may have been an error. I have many more thoughts on handkerchiefs, but they'll have to wait until next week, because that's the kind of cliffhanger that I like to leave you on when it's a Friday afternoon. 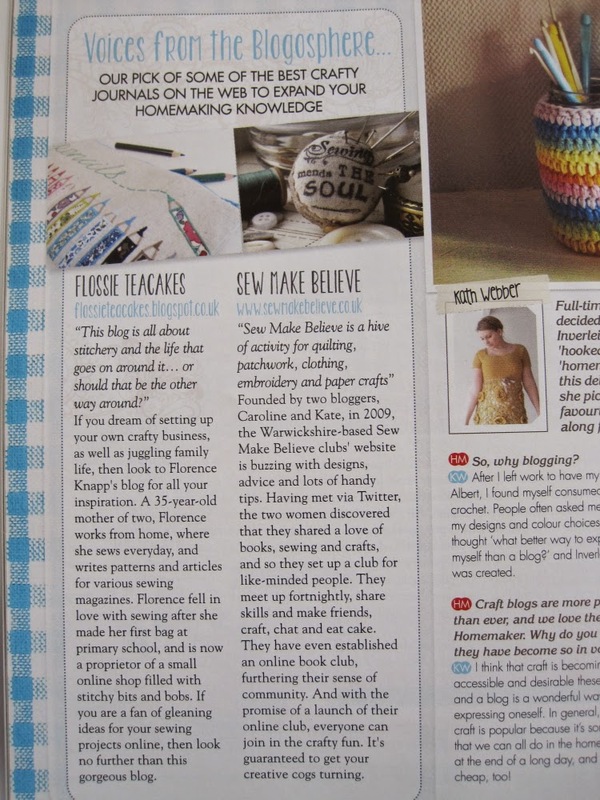 I'm rather delighted to find myself in Homemaker Magazine this month in their 'Voices from the Blogosphere' feature. It's factually incorrect in places, but it's very nice to find myself a year younger than I really am at least! I think this may be my own fault for not having updated my biography for some time! I haven't bought Homemaker Magazine before, but goodness, it's lovely and I feel quite delighted to appear in its pages. 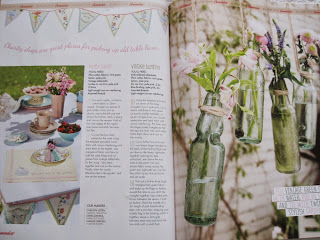 It has a definite craft bent to it, but it's also got a very large dollop of homemaking and interiors-related talk to go with it - it's a combination that really works and which offers something different to the kind of content I come across freely with the blogs that I follow (I tend to follow pure craft blogs as if I began following design blogs too I think I'd begin to feel a little overwhelmed). 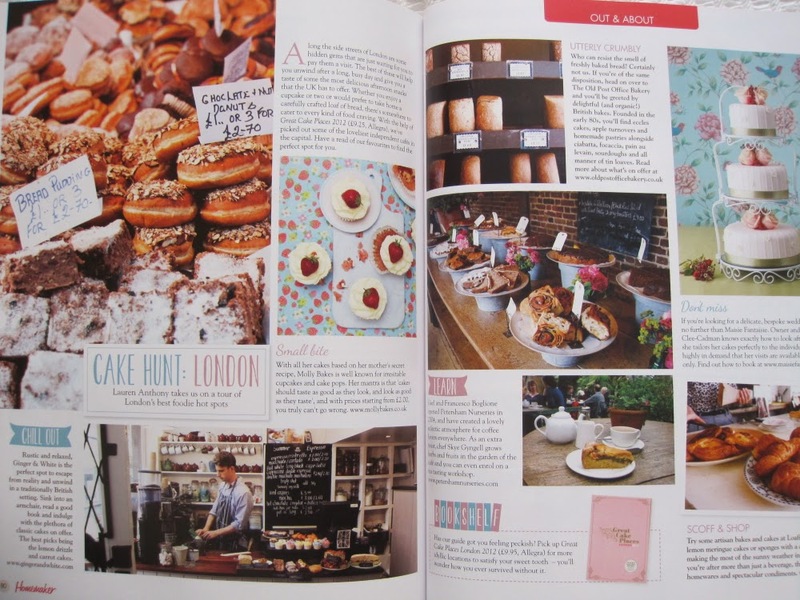 I always love baking-related pieces and there were quite a few. 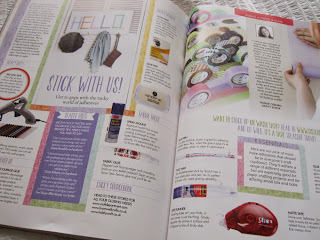 As well as the more geeky bits where a double-page spread is dedicated to discussing different glues. This morning as I dried my hair I read a quick article in there about how to properly wind and take care of an old clock. I don't actually have a clock in our house that needs winding or taking care of*, but I love reading about the processes undertaken for maintaining something like so traditionally made if I did. I hope you have a lovely weekend planned. My own will involve some baking and revelling in it being the first weekend I can remember for a long time when all four of us are home together all day on a Saturday (my husband normally coaches my son's football team, so they tend to be out until at least lunchtime). *Actually, I have a very small digital alarm clock which my father brought home for me from a business trip when I was 14. When I went to university I spray-painted it silver and it's spent the last 15 years shedding slivers of paint and generally looking increasingly disgusting. My husband often asks why we have to have this awful alarm clock next to his side of the bed (asks in a fairly rhetorical way, as I know he couldn't actually throw it out either) but I can't bring myself to get rid of it. The article offered no guidance for taking care of such a clock, but I think that may require a more specialist publication, such as 'Hoarders Weekly'. Today, I bring you some photos of Manjit Sidhu's glorious sewing shed, which I've kindly been given permission to share with you. 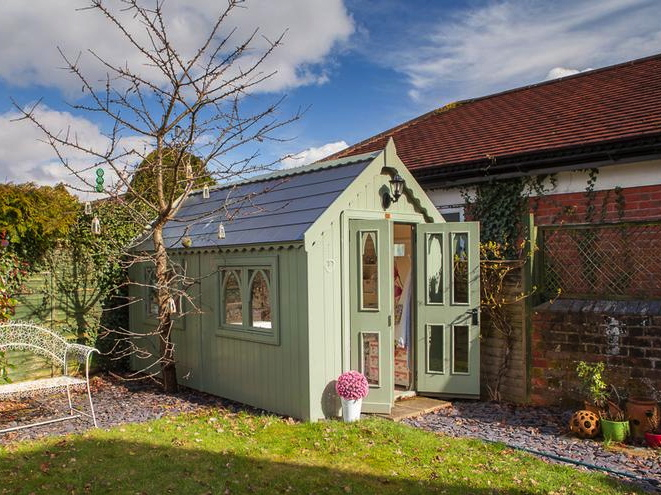 I first saw this shed on Twitter when Manjit's friend, Catherine, asked me if I'd vote for it as it has been entered into a shed competition (you can vote too if you'd like to - it only takes a second). 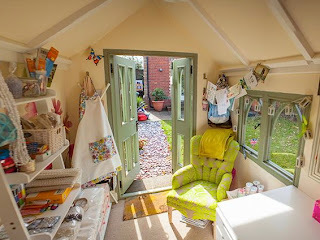 I have totally fallen for its gothic windows and lovely green and pink colour scheme. The shed comes from The Posh Shed Company and is quite possibly one of the loveliest sheds I've ever seen, although I feel chilly just imagining what sewing through the winter in it might be like (particularly as it's May and I currently have the heating pushed up to 24 because it feels like it might never be warm in England again. Having my heating use dictated by what month it is no longer seems a logical ground for deciding such a thing. And for ardent environmentalists who may disapprove of that statement, in my defence, I've made only three short-haul plane journeys in the last eleven years and I've been a vegetarian since I was four years old, which is apparently the single most effective change you can make for having a positive impact on the environment, so I indulge my love of a warm house without guilt). 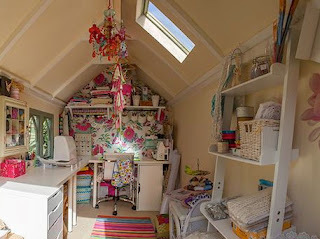 I love that a shed is so detached from a house that you could go completely wild decorating it. I think my husband and Nell might like to be in one of these during the summer months...or maybe I'd just like them to be in one as Nell is now in the frustrating stage of puppyhood where she moves from one piece of badness to another and has been making her way through computer cables, skirting boards and parts of my kitchen. She is rarely let out of our sight for longer than thirty seconds, but it's amazing how much damage she can do in that short time and also how cleverly she places a toy as a decoy next to the illegal item she's chewing to lull us into believing that she's just innocently chomping away on a stuffed rhino. 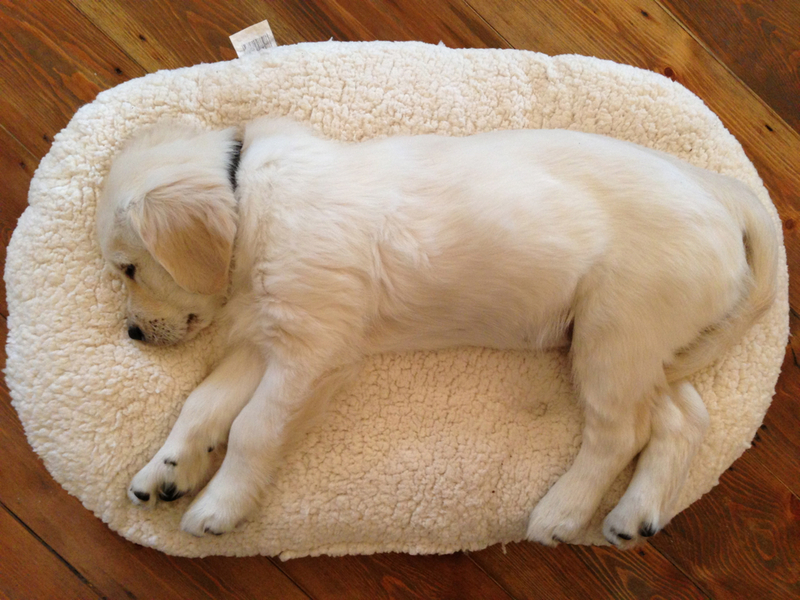 When it comes to golden retrievers they grow so quickly that she no longer looks like the puppy in the photo above, but rather like a small, but very proper adult dog. Which brings me on to dogs on furniture. 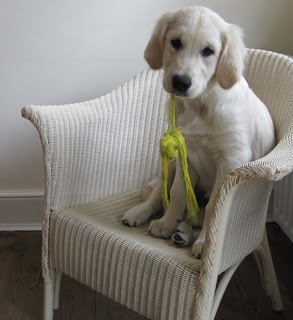 I am uncompromising about not wanting her on sofas or upholstered chairs, especially as in six months time she'll be a malting, long-haired mass of gold, but does giving a dog a chair of their own stop them from being quite so persistent in their attempts to share human chairs? I found her on this old wicker chair this morning and thought that I'd actually be quite happy for this to be Nell's chair (will an adult golden retriever curl up to fit on such a chair though?) if it would mean she felt she had a place of her own that's higher than her bed, which seems to be what she covets. These photos make her look really quite small still, but it's quite amazing how strong she is. The weekly photos my husband has been taking of her on the Florence height-chart (that's her size relative to a human Florence. Do you see how he tries to draw me in to be a part of his dog's life?) are soon to come to an end as I can barely lift her. Dogs are so very different from cats: she is a solid mass...a bit like a house brick...or a large boulder. I've been mostly working on Squeebles-related things for the last week or so, but I did fit in a quick fabric-buying trip to London one day. I went to the shops on Goldhawk Road, where fabric is only a few pounds per metre, and then on to the Cloth House on Berwick Street, which is far more expensive, but does have an amazing selection. 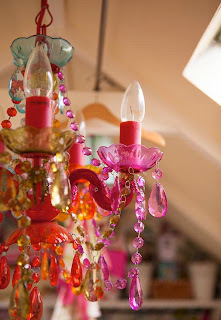 Some photos of my haul will punctuate this post. The Great British Sewing Bee has somehow come and gone without my managing to blog about it in between, but wasn't it wonderful (I think you can still see it on iPlayer if you missed it)? I watched it with my children and we loved it just as much as we had the Bake-off series (although I loved it a little more, obviously), from the same production company. I haven't heard of anyone who didn't enjoy the Sewing Bee* and I wonder if it's because it has the same successful formula as the bake-off: the fascination of reality-style television, but with the welcome twist of it containing genuinely nice, normal people being filmed in a way that isn't concentrated on stripping them of their dignity. Anne was an obvious winner right from the start, but that didn't stop it being hugely enjoyable to watch, perhaps because as with sewing, it's more about the process than the result. I felt slightly pained by some of the time constraints though: four hours to make a man's shirt! Even with the cuffs being omitted this seemed like an incredibly pressured task, so the results were fairly amazing. 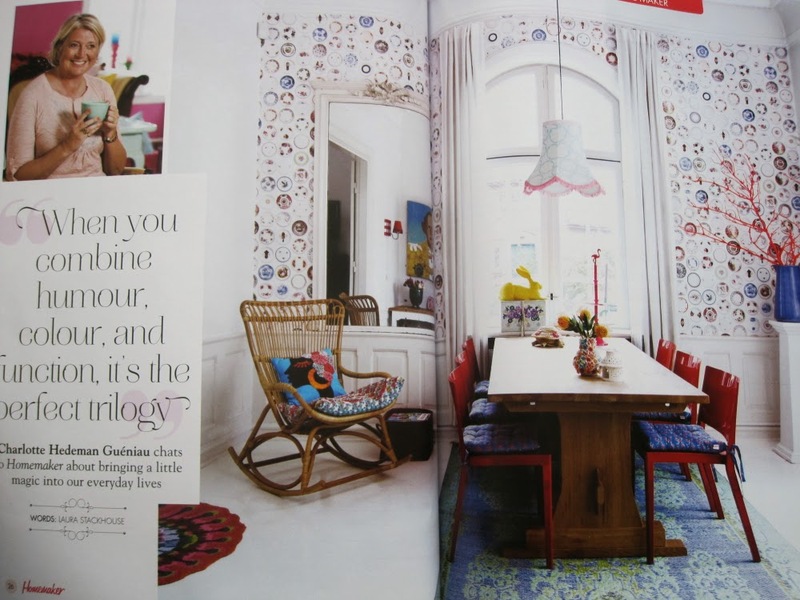 I was fascinated by how the programme may be perceived by those who don't sew though. One friend said that it didn't inspire her to sew clothing as it looked so stressful, while others were baffled by the terminology. There are some things that, as a seamstress immersed in an online world where everyone sews, you assume are part of common language. There has been much hilarity from my children over some of the terms learnt while watching the programme, as well as some teasing over what I only now see is my rather predictable solution for styling any garment when asked 'what would you do?'. 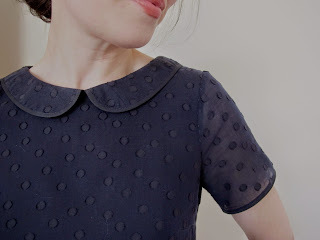 One morning I was pinning a collar onto a Laurel blouse that I was making and my eight-year old son came in and asked if it was a 'Peter Pan collar' that I was creating. I was fairly stunned, but apparently he is familiar with this term because, in his words, 'you think it would be best to put a Peter Pan collar on everything, even trousers'. Warming to impressing me with his technical sewing knowledge, he then enquired if the collar would be attached 'above the bust' or 'below the bust', chortling to himself wildly as he asked this non-sensical question. He was an alarmingly good mimic of Patrick Grant (the judge from Savile Row) and swept his hands over the garment while commenting on whether my placement of the darts around 'the bust' was quite correct. Both children were fascinated as to why Patrick would never simply say that the fit wasn't right over a person's breasts and were disbelieving when I told them that 'the bust' was more polite and that in dressmaking you'd never refer to someones breasts. But I can still hear them impersonating Patrick and May while they brush their teeth before bed some evenings asking one other if they put their toothpaste onto the toothbrush while holding it above the bust or below the bust. Anyway, Love Productions have asked if I'll share their request for entrants for the second series which will be made in the coming autumn and winter. If you're interested in applying, then do go and visit here. I'm so looking forward to watching the second series. What did you think of the Sewing Bee? Did you love it? Could you sew under that kind of pressure? Are you considering entering? * Apart from sometimes in the online commenting section beneath newspaper articles about the Sewing Bee. I've noticed that these comment sections often seem to contain the thoughts of people seemingly angry at the entire world. They scare me slightly.